For the Bee’s third birthday, I wanted to do something special. She was very into the play kitchen at her school and I was very into Pinterest so I decided to make her a play kitchen. I put my friend Sue on the lookout to help me find a piece of furniture I could modify. I paid $15 for this little gem at the Forks Thrift store. 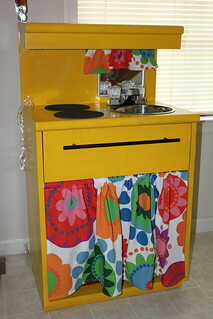 A big part of the fun for me was gathering up the other items to customize the kitchen. I picked up a square mirror at Dollar Tree along with a baking pan, measuring cups, scrub brush, mini watering can, and a hand broom with dust pan. I spent a lunch break picking up the mixing bowl for the sink, and wandering the aisles of The Restaurant Store in Allentown with Jen of Around the world in 80 Cakes. The project also let me visit the Habitat for Humanity Restore and every hardware and plumbing store in the area looking for a faucet; I ended up with the least expensive one Walmart carries. The handle, purchased at Lowes was one of the more expensive additions, but I love the way it looks and it made it easy for her to pull open. The two burners are thin wooden circles from Hobby Lobby that I spray painted and used a single nail to attach to the top. 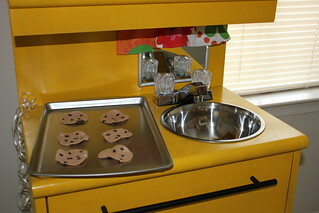 I also painted knobs for the “stove” but decided they would get in the way so I kept them for a future project. The fabric was an Ikea purchase that was already in my sewing stash, and I used a tension rode for the bottom curtain and a tiny curtain rod for the one on the “window”. You can’t see from the photos, but I also found two fabric bins that fit perfectly on the shelves to store her pots, pans, play food, and anything else she can find to stash. Of course, her favorite thing on the entire kitchen is the $3 tap light I installed above the sink. Figures! But I had a great time working on it. So much so that I picked this lovely nightstand from my neighbor’s trash pile a couple of weeks ago and I’m just waiting on a little time and inspiration to transform this one into a kitchen I can hopefully sell– craigslist anyone?